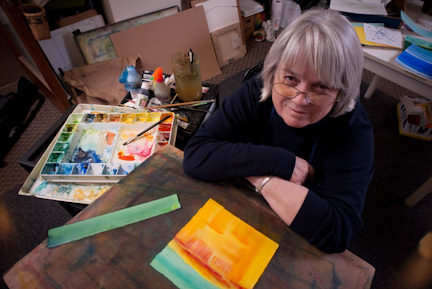 I’m an abstract landscape painter living and working in Hampton, NH. I work in a small studio in an old factory building a couple of miles from the ocean. I’m currently working in watercolor and mixed media collage. Photo courtesy of my dear friend Jay Reiter. Hi Ethel: Thank you so much for your email following the seminar on Phil. I returned your email but seem to be blocked by a filter; I would be happy to send my free e-mini book to you “Reclaim Your Life” however I am so impressed with your site, I would imagine you would never have time to read as you are doing so many exciting things in Art. My site is very new. I am enjoying the process of getting it up, and I enjoy passing on my own experiences to help others through challenging times. Your site will certainly be interesting to me and I shall enjoy exploring it. Thanks for the kind words. I don’t know why the email isn’t working. I’ve gone on your site and tried signing up. Maybe that will work. Thanks so much, Nancy. I looked at your site and your blog. It looks like you’re having great fun, which is so important. You don’t say how long you’ve been doing the collages, but you’ve got a significant number of pieces on your site. I’d be interested to see your oil paintings as well to see how the two bodies of work relate. Keep up the good work.